We clarify Illinois government with short videos & helpful summaries on the issues that matter to you! We have a new podcast to add to your feed, IL Informed! 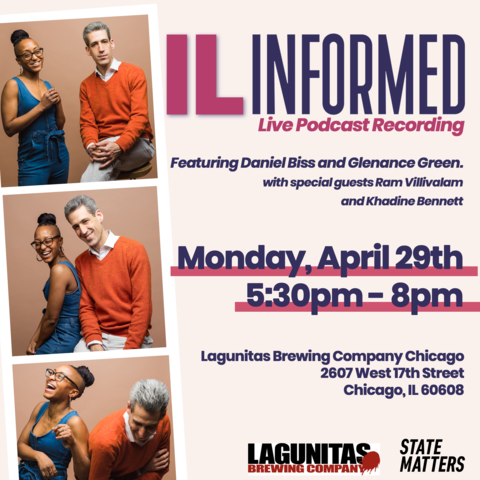 Poet, activist and researcher Glenance Green and former state legislator/gubernatorial candidate Daniel Biss, come together to talk Illinois politics, government and how the heck it all works (or doesn’t) in Springfield. Check it out! Get tickets to the live show! Corruption | Ready to Do Something About It? How does “session” work in Illinois? How to Contact your Representatives! Ballot Measures & Initiatives. Huh? What? Ricardo and Melissa Explain Witness Slips!